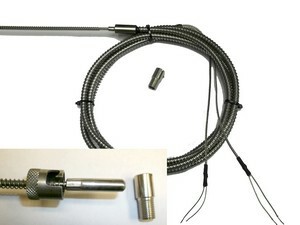 A Type K duplex 3X210mm mineral insulated thermocouple with 6X30mm Protection sheathed tip. The MI has a strain relief spring with 1/8" single bayonet fitted to the end. It is then terminated to 2mtrs of Type K fibre glass stainless steel overbraided extension lead protected by 7mm stainless steel conduit.